As broadband has unveiled a new world for subscriber, full of advanced capabilities and faster speeds. Your challenge is to meet their demands without compromising your budget. Because of its distance, speed and bandwidth potential, fiber optics has become the choice for many service providers. Fiber optic connections typically requires two strands of fiber – one for transmitting and one for receiving signals. But how to do if you need to add services or customers, but you’ve exhausted your fiber lines? Thanks to CWDM, coarse wave division multiplexing (CWDM) is a method of combining multiple signals on laser beams at various wavelengths for transmission along fiber optic cables. The number of channels is fewer than in dense wavelength division multiplexing (DWDM) but more than in standard WDM. CWDM has many advantages over DWDM technology in terms of system costs, set-up, maintenance, and scalability. CWDM is a technology which multiplexes multiple optical signals on a single fiber optic stand by using different wavelengths, or colors, of laser light to carry the different signals. Typical CWDM solutions provide 8 wavelengths capacity enabling the transport of 8 client interface over the same fiber. However, the relatively large separation between the CWDM wavelengths allows expansion of the CWDM network with an additional 44 wavelengths with 100GHz spacing utilizing DWDM technology, thus expanding the existing infrastructure capacity and utilizing the same equipment as part of the integrated solution. A single outgoing and incoming wavelength of the existing CWDM infrastructure is used for 8 DWDM channels multiplexing into the original wavelength. DWDM Mux Demux and optical amplifier if needed. The typical CWDM spectrum supports data transport rates of up to 4.25Gbps, CWDM occupies the following ITU channels: 1470nm, 1490nm, 1510nm, 1530nm, 1550nm, 1570nm, 1590nm, and 1610nm, each separated from the other by 20nm. PacketLight can insert into any of the of the 4 CWDM wavelengths (1530nm,1550nm,1570nm and 1590nm), a set of additional 8 wavelength of DWDM separated from each other by only 0.1nm. By doing so up to 4 times, the CWDM network capability can easily expand by up to 28 additional wavelengths. 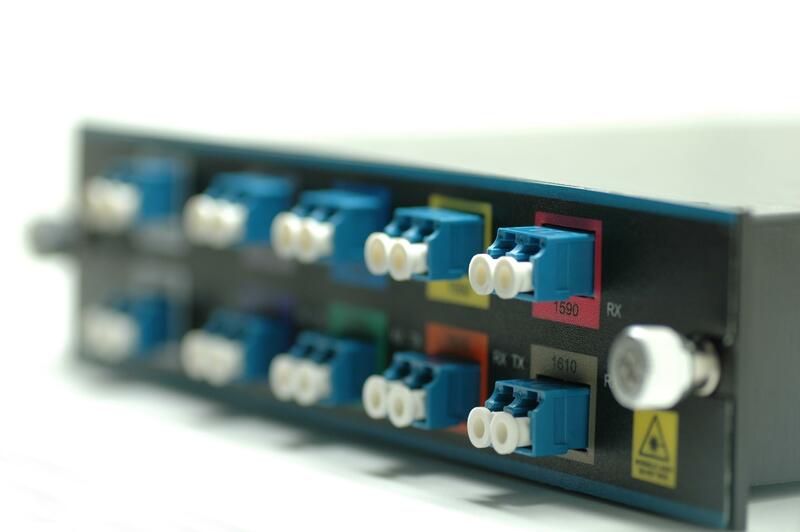 With FiberStore’s compact CWDM solutions, you can receive all of the above benefits and much more (such as integrated amplifiers, protection capabilities, and integration with 3rd party networking devices, etc.) in a cost effective 1 U unit, allowing you to expand as you grown, and utilize your financial as well as physical resources to the maximum. FiberStore provides all the component involved in the process, such CWDM MUX DWMUX, CWDM OADM, even CWDM SFP transceivers.